How Chemin de Fer Baccarat differs from classic Punto Banco? Baccarat is oftener viewed as one of the best no-brainer games at the casino and is as easy to play as CAD online slots. With a house edge as low as 1.17 per cent and the absence of hitting or calling, Punto Banco can be both fun and rewarding for all types of gamblers. While there certainly are tables with higher limits, it is not specifically a high-roller game. That honour goes to the more traditional version of Baccarat known as Chemin de Fer. The classic game of Chemin de Fer originated in France and translates to “railway”. If you are familiar with your classic 007 films, you may have seen James Bond playing a round or two in some of the most iconic casinos in Europe. The great thing about Chemin de Fer is that players around the table take turns in being the banker. With the more popular Punto Banco (Player/Banker) version, all bets are placed against the house. 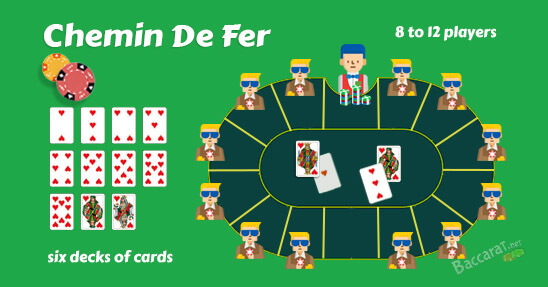 The basic rules of the game are the same except that in Chemin de Fer, there are a few more decisions to make and a few less betting choices. Since most players are familiar with Punto Banco, we will focus on how Chemin de Fer is different. The game is played on a classic horseshoe table that is often found in the high-roller section of the casino. Usually, the table can accommodate from 8 to 12 players with one croupier and two dealers managing the bets. The player immediately to the right of the croupier (in the centre of the table) is the first to take on the role of the banker. Everyone else is designated a “player”. Players may opt to skip their turn as banker and pass to the next player. The designated Banker for the round puts down an amount that they are willing to risk for the round. This can be any size from the minimum to the maximum table limit. The players can then bet against the banker at whatever amount they choose. If a player chooses to bet the full amount, the other players cannot bet. If not all the player’s bets make up the full banker amount, spectators can join in. After the bets are placed, the 5% house take is split off the table. The dealer then deals the banker two cards face down and the player hand two cards face down. The player with the highest bet is chosen to represent all the other player bets at the table. The player has the option of choosing a third card if desired. There is no requirement to do so. If the player hand outranks the banker hand, all players will receive a payout of 1:1, which is covered from the Banker’s amount. If the banker’s hand wins, all the bets then get passed to the banker. In the case of a tie, the bets stay on the table and a second round is played. With Chemin de Fer, being the banker can be rather lucrative and is a great option for high rollers.